Size doesn’t matter. Nothing proves that more true than Falcon Northwest’s new Tiki, which packs the most power per cubic inch I’ve ever seen in a PC. One look at these specs will have you crying nerd tears of joy. Falcon jammed an 18-core Xeon E5-2699 V3 CPU inside the Tiki's 4-inch wide case. And yes, that CPU has Hyper-Threading, so be prepared to feel your jaw slap your face after it has bounced off the floor when you pull up the Task Manager in Windows and see the Tiki's thread count: 36. It doesn’t stop there though. Falcon taps none other than Nvidia’s beastly GeForce GTX Titan X for graphics. Besides being able to play many of today’s games at 4K resolution by itself—though you’ll still want a G-sync panel in my opinion—it's also a tour de force of specsmanship with 12GB of RAM and a GPU core with 3,072 shader units. The paint scheme on the Falcon Northwest Tiki is called tangerine. Jaw not on ground yet? It won’t resist this: For storage, the Tiki packs none other than Intel’s cutting-edge 750-series NVMe SSD, and for kicks, a 6TB hard drive and Blu-ray burner. Remember: The Tiki packs all that firepower into a chassis 4-inches wide, 13.25-inches tall and 13-inches deep. Impossible! After all, you’re thinking, you can’t get an LGA2011-V3 CPU into such a small machine, much less an 18-core Xeon. That may have been true last year, but this spring Asrock released its crazy X99E-ITX/AC motherboard, which did what others told me was impossible: Put a massive LGA2011-V3 socket into a tiny Mini ITX motherboard. You see, the X99 chipset and its big-boy CPUs feature quad-channel memory controllers, and that means you need four pieces of RAM. Falcon Northwest uses Asrock’s new X99E-ITX/AC to get the 18-core Xeon inside its Tiki. Besides the LGA2011-V3 socket being physically larger than the typical consumer LGA1150 socket, also including support for four pieces of full-size DDR4 modules is the (theoretically) impossible part. 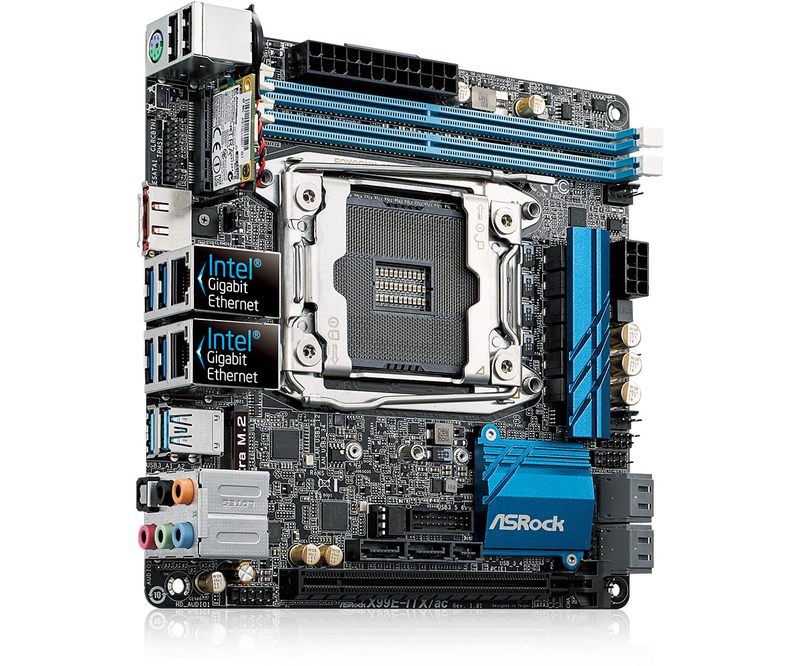 But Asrock thought outside the box and decided to simply leave two of the memory slots out. There's a cost to this in memory bandwidth though. Rather than quad-channel, you end up with dual-channel RAM. I measured an X99 system with quad-channel DDR4/2400 RAM at 55GBps of bandwidth. The Tiki is has less than half that, at 26GBps using DDR4/2133. Falcon Northwest's console-sized PC may give up memory bandwidth, but at least it has plenty of memory capacity. Despite its size, the Tiki I received for testing had 32GB of ECC RAM in it, and Falcon just certified 64GB ECC modules. The 18-core Xeon E5-2699 V3 (left) is actually physically larger than the 8-core Core i7-5960X (right). The real star of the show is the CPU though: The 18-core Xeon 2699 V3 chip with a base clock frequency of 2.6GHz and a Turbo clock speed of 3.6GHz. Although it clips into the standard LGA-2011 V3 socket, it’s actually physically larger, no doubt to accommodate the extra cores. The chunky chip makes the already beefy Core i7-5960X CPU look positively anemic. As a Xeon, the E5-2699 V3 gives you 40 PCIe Gen 3.0 lanes and actually supports running in a multi-processor configuration, which is lingo for saying you can run two of these CPUs if you dare in the same in same PC. The cores themselves, though, are still Haswell cores. Clock-for-clock, they should perform no better or worse than another Haswell core at the same clock speed. Since the Xeon has 18-cores under its lid instead of 8, it’s actually a fairly hot chip, with a TDP rating of 145 watts. The Tiki keeps its thermals under control with an Asetek closed-loop liquid cooler. I’ve put together a quick comparison chart of the Xeon and two other common high-end Intel chips here. Here’s what the 18-core, 36-thread Falcon Northwest Tiki looks like during our Handbrake encoding test. Just why the hell do you need an 18-core CPU? For most consumers, a quad-core is plenty, and many people don’t even really need Hyper-Threading. But for the prosumer, who does encode video or earn a living money as a 3D modeler or generally runs multiple, multi-threaded workloads, a 6- or 8-core CPU pays true dividends and an 18-core takes that to the nth degree. The fact is the Xeon-packed Tiki is massive overkill for someone who doesn’t truly use workstation-class applications or isn’t running 20 simultaneous virtual machines. But dammit, it’s a glorious overkill in a way that's only possible on the PC. And, of course, for the .1 percent of power users, this many cores pays heavy dividends. More on this in our performance section later. Falcon Northwest cleverly uses an Intel 750-series SSD in SFF-8639 form in its Tiki. Besides the CPU and GPU, Falcon pulls off a real nifty hat trick un getting an Intel 750-series SSD inside the Tiki. Most of you know the Intel 750-series drives in its PCIe-based trim, which our review put at the front of the class in performance. That’s not even mentioning the support for NVMe. So how does Falcon get both a Titan X and the PCIe 750 in here if the board only has one PCIe slot? Simple: Falcon uses the SFF-8639 version of the drive. It may look like a standard SATA drive but it’s actually meant for server or workstation use. The drive connects to the Tiki using an MSI universal Mini SAS connector that fits into the board’s M.2 slot. This gives it a full fidelity x4 PCIe Gen 3 connection, and I tested the drive easily hitting 2.7GBps of sequential read speeds. For comparison, the RAID 0 SATA setup in the Falcon Northwest Mach V reviewed here was in the comparative slow lane at 1GBps. All three CPUs on this chart are Haswell-based CPUs with tne only difference being clock speeds and core counts. The 18-core Xeon represents well, even against, the 8-core Core i7-5960X that's overclocked beyond 4GHz. None of this matters if the Tiki doesn’t perform well. This is clearly no run of the mill computer, so I decided to see how it would perform against PCWorld’s standard zero-point box using a bone stock quad-core 3.5GHz Core i7-4770K and the Tiki’s big brother, the Falcon Northwest Mach V with an eight-core Core i7-5960X overclocked up beyond 4GHz. My test would be Maxon’s CineBench R15, a popular highly multi-threaded 3D modelling benchmark. 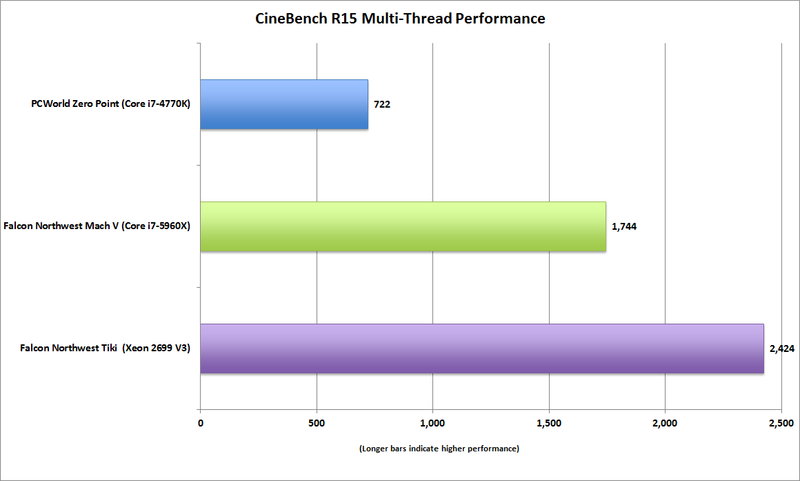 If you have the threads, CineBench will use them. 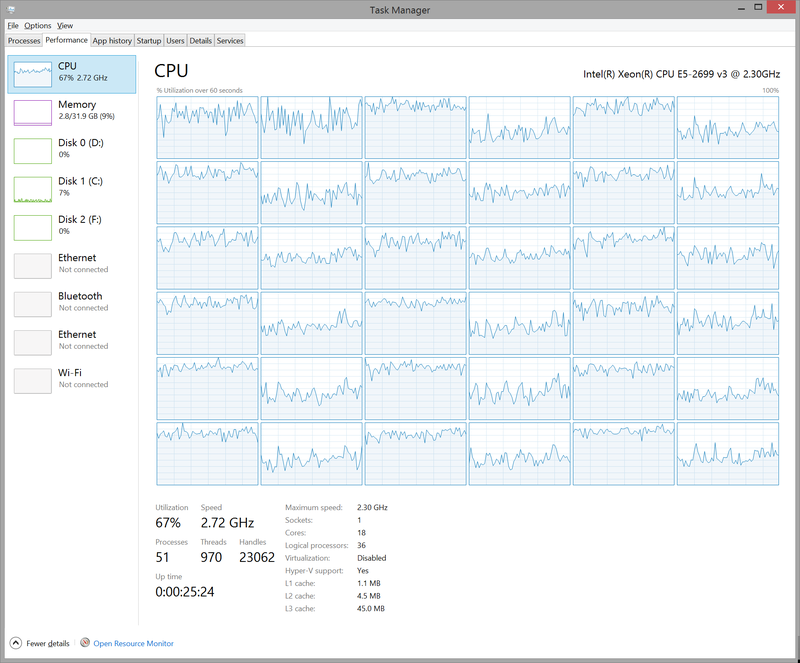 As you can see from the chart, the 18-cores in the Tiki slaughter the quad core. Although it’s not twice the performance of the eight-core Haswell, it still opens up a sizeable performance lead. Let me remind you that the eight-core chip is moving along at a brisk 4GHz while the 18-cores are closer to 2.7GHz, so this isn’t bad. The 18-core Xeon surpsiringly took the honors in our Handbrake encoding test, but not by much. That’s a warning to anyone who thinks it’s easy to find apps to feed this beast of a CPU. The problem is, finding applications to exploit those cores is tough. Professional workstation applications will utilize the Xeon CPU to its fullest but anything pedestrian will fall short. 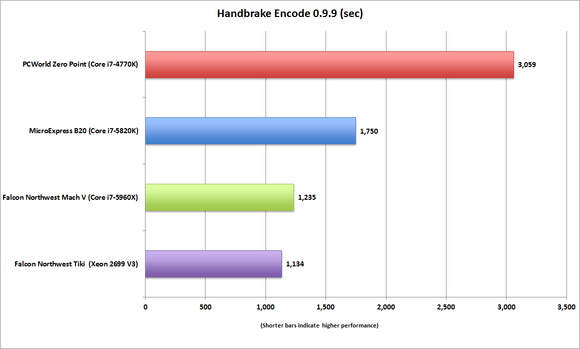 For example, we ran our Handbrake encoding test with the same machines as above, plus the six-core MicroExpress B20. The Tiki comes in first again, easily beating the quad-core—but the performance gap between it and the eight-core and six-core box is a lot closer than you’d expect. That was a shocker because I’ve never seen Handbrake not eat a core it could see. Part of my problem may be from the workload: a mere 1080p high-bit rate MKV file. Anandtech’s Ian Cutress saw a 14-core Xeon V3 chip walk away from all others but only when doing a “double 4K” video load encode with Handbrake. The take away: To really use hardware this extreme, you better have extreme tasks. 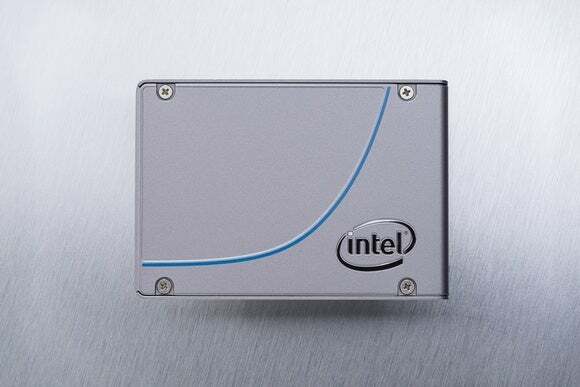 Professionals—you know who you are—don’t have to worry about it, but average power users might have a problem putting this Xeon to work. You knew there was no way too tip toe around this topic: the cost of the Tiki is as astounding as the specs and performance. You’re looking at $9,196 for the lower-end configuration with “just” 32GB of DDR4/2133 RAM. Taking the 64GB option adds $800 to the price tag. Ouch. It's no surprise, but much of the cost comes from the components inside. The CPU itself (which oddly doen’t have a list price on Intel’s website) pushes $4,300, I'm told. Still, that puts the Tiki with one Titan X near the price of a system with three Titan X cards in it. Falcon said cost-averse buyers can shave half the price off by going with an six-core chip and lower-end SSD. Despite its compact size, it’s actually easy to access to the internal components once the side is popped off. For the person who knows how to exploit it, though, you’d be hard pressed to find more hardware in a smaller box today. It’s practically a small form factor workstation. And don’t think Apple’s Mac Pro will give it a run for the money. The Mac Pro, believe it or not, still uses an Ivy Bridge CPU and tops out with 12-cores. I didn’t test the Mac Pro, but 18 Haswell cores will eat a 12-core Ivy Bridge machine, and the Titan X against three-old FirePro GPU is no race at all. Overall, the Tiki is an amazingly compact overpowered PC, but anyone who buys it better know why they need it and what they’ll use it for. For a size comparison, the 18-core, GeForce Titan X-equipped Falcon Northwest Tiki sits between a Sony PlayStation 3 and an Xbox 360.